Image uses for illustrative purpose. An oil pump jack pumps oil in a field near Calgary, Alberta, July 21, 2014. Pump jacks are used to pump crude oil out of the ground after an oil well has been drilled. LONDON - The global oil market could move into deficit sooner than expected thanks to OPEC's output agreement with Russia and to Canada's decision to cut supply, the International Energy Agency said on Thursday. "For 2019, our demand growth outlook remains at 1.4 million bpd even though oil prices have fallen back considerably since the early October peak," the IEA said. "Some of the support provided by lower prices will be offset by weaker economic growth globally, and particularly in some emerging economies." The decision by the government of Canada's Alberta province to force oil producers to curtail supply will bring the largest reduction to crude output next year, the IEA said. In its previous report in November, the IEA said it expected the global oil market to remain in surplus throughout 2019. 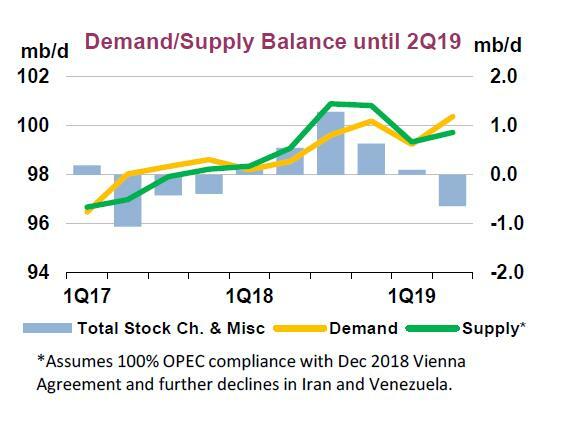 Now, it expects a deficit to materialise by the second quarter of next year, provided OPEC sticks to its supply deal. "Time will tell how effective the new production agreement will be in rebalancing the oil market," the IEA said. "Uncertainty about trade tensions and tighter monetary policies continue to affect confidence and investment. The OECD’s lower expectation for the world economy in 2019 could reduce oil demand growth by roughly 100,000 bpd," the IEA said.